Head of the Reform and Reconstruction Alliance, Sayyid Ammar al-Hakim, in his office in Baghdad, received His Excellency President Barham Saleh Tuesday 20/11/2018 His eminence with Saleh discussed outcomes of HE recent regional tour. President Saleh congratulated his eminence for being elected as head of the Reform and Reconstruction Alliance. His eminence underlined the importance of regional tours and presenting the positive aspects of the Iraqi experience to the world and the region, and emphasized that communicating on basis of common interests is necessary for Iraq, and called on to exclude Iraq from the regional and international axes. 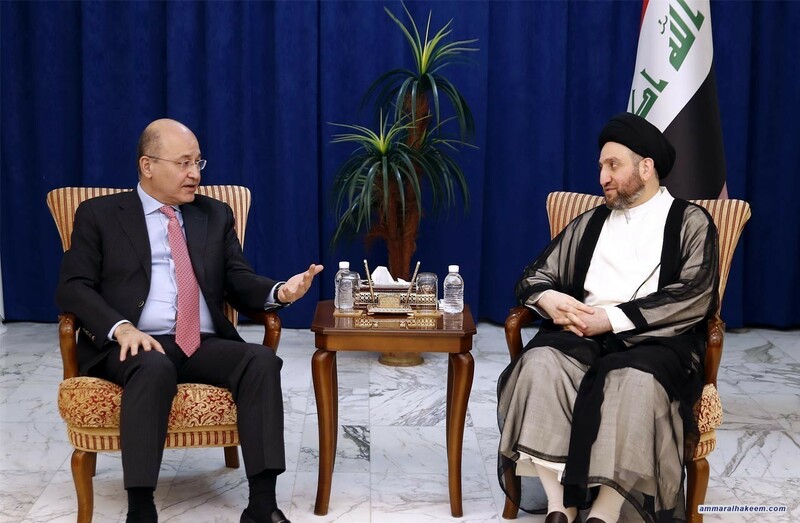 Regarding the political aspects, his eminence renewed his call to complete the government cabine, and urged everyone to shoulder their responsibilities towards this important entitlement so that the government is able to implement its development program.